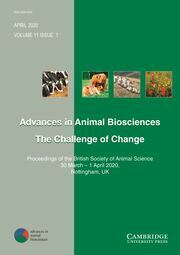 Advances in Animal Biosciences is an associated publication to the journal animal. It aims to publish high-quality conference, symposium and workshop proceedings about animal-related aspects of the life sciences with emphasis on farmed and other managed animals. These can be in the form of a book of abstracts, summaries or complete papers. The format will highlight the title of the meeting and organisations involved but the publications will have the added advantage of forming a series under Advances in Animal Biosciences. Subject areas can include aspects of Breeding and Genetics, Nutrition, Physiology and Functional Biology of Systems, Behaviour, Health and Welfare, Livestock Farming Systems, Human Health and Product Quality. However, due to the integrative nature of biological systems, monographs and conference proceedings dealing with the translation of basic and strategic science into the whole animal and farming system and the impact on Productivity, Product Quality, Food Security, the Environment, Climate Change and Humans will be particularly welcome. How to increase litter size in rabbits?